What are the 2013 Roth IRA phase out rules? 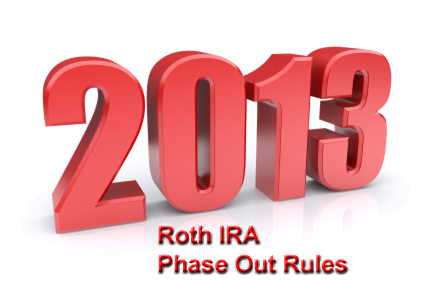 So if you plan to make a Roth IRA contribution this year, you need to know the 2013 phase out rules. Otherwise, you risk inadvertently contributing more than the allowable IRS limit. So what are these income ranges according to the 2013 Roth IRA phase out rules? So how do you calculate a 2013 Roth IRA phase out contribution? One way to calculate your 2013 contribution limit is to take your income, subtract the maximum income you can earn while still making the maximum contribution, and divide that figure by the phase out range for your tax filing status. For such persons, the 2013 Roth IRA phase out rules take effect if you earn between $178,001 and $188,000. You and your spouse are both 46 years old with a combined income of $183,000. At first glance, it's clear that you're ineligible to make the maximum $5,500 contribution, but it's also clear that you haven't surpassed the $188,000 threshold which bars you from making a contribution. So, in this case, $2,750 is the maximum amount you can contribute. Once you reach age 50 and the maximum Roth IRA contribution rises to $6,500, your contribution limit under the same circumstances is 50% of $6,500. Which, of course, is $3,250. In such a case, the 2013 Roth IRA phase out rules take effect if you earn between $112,001 and $127,000. Let's also say you're 28 years old with an earned income of $116,500. Since your income falls within the $112,001 to $127,000 range, how much can you contribute? According to the 2013 Roth IRA phase out rules, it means you can make a contribution that's 30% less than the maximum Roth IRA contribution for your age bracket. So, in this case, $3,850 is the maximum amount you can contribute. If you're 50 years old or older instead of 28, the maximum Roth IRA contribution limit is $6,500. So your contribution limit under the same circumstances above is 70% of $6,500... or $4,550. How do the 2013 Roth IRA phase out rules effect you? For such people, the 2013 Roth IRA phase out rules take effect if you earn between $1 and $10,000. So $1,210 is the maximum amount you can contribute. Which comes out to $1,430. Just make sure to keep the following rules in mind. 2) A $200 Minimum - You can't have a maximum Roth IRA contribution limit of less than $200 unless you're ineligible to contribute at all. So if your 2013 Roth IRA phase out contribution calculation tells you you're eligible to contribute $150, round that figure up to $200. So how does all of this effect 2013 Roth IRA catch up contributions? Follow these 2013 Roth IRA phase out rules, and you'll have no problem at all calculating your precise Roth IRA contribution limit for the upcoming year.